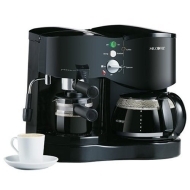 alaTest a collecté et analysé 34 avis de consommateurs et d'experts pour le produit Mr. Coffee 8-Cup Thermal Programmable Coffee Maker, JWTX85. La note moyenne du produit est 2.9 sur 5, tandis que les autres produits de même catégorie ont une note moyenne de 4.2 sur 5. Les testeurs apprécient le rapport qualité/prix. Le comfort d'utilisation impressionne, mais les auteurs d'avis sont moins positifs sur la taille. Après analyse des notes de consommateurs et d'experts, de l'âge du produit ainsi que d'autres facteurs, et comparé aux autres produits de même catégorie, le Mr. Coffee 8-Cup Thermal Programmable Coffee Maker, JWTX85 obtient un alaScore™ de 76/100 = Bien. have had only couple of days but so far so good. no complaints for $70. I would totally recommend this machine to all. Definitely worth the money, especially if you need the Win7 compatibility like I did. Shipped from New Jersey. I live in San Diego, so it took a week to get here which is odd for Newegg. Everything is layed out really well. I like how I can remove the water resevoir and fill that instead of the Decanter on the coffee maker side. The expresso are also easy to make, and relatively easy to clean. The price is good too. I am truly satisfied with the product. Wonderful item - whether espresso, capuccino or coffee is desired, this one machine can do the work of three. Countertop / space saver, at an exceptional price. Prompt delivery.